Billionaire Bill Gates took one step back and put one foot forward this week. He announced that TerraPower, the firm in which he is a major investor, will pull out of its plan to build a prototype of its Traveling Wave advanced reactor in China. Also, he wrote in a widely distributed email letter that he plans to do more in 2019 to promote the use of nuclear energy to address the challenge of climate change. TerraPower, a nuclear energy startup which includes Bill Gates as one of its key investors, has been forced to cancel its plans to spend $ 1 billion to build a half-size prototype of its advanced design nuclear reactor in China. It is unclear whether the firm will look for a new partner in the U.S., or elsewhere, to conduct early-stage trials of its reactor technology. The decision to end the work in China follows a new set of U.S. government rules on export of nuclear technology to China. The rules were issued in October 2018 in response to repeated instances by China of stealing intellectual property related to nuclear energy from U.S. firms. TerraPower formally set up an agreement with state-owned China National Nuclear Corporation (CNNC) in 2013 to build its first of a kind half size version of its Traveling Wave reactor. The design is unique in that it is based on the use of depleted uranium to run the reactor. “We had hoped to build a pilot project in China, but recent policy changes here in the US have made that unlikely,” Gates wrote in a blog post. He said TerraPower may be able to build it in the US, but qualified that idea with two caveats. The first is that federal funds would be available and the second is changes are made in the way the NRC conducts safety evaluation design reviews of advanced reactors. As a practical matter neither of Gates’ preconditions is likely to be resolved anytime soon. DOE has been releasing funds for work on SMRs and advanced reactor technologies, but not on the scale that TerraPower would need, e.g., $ 1 billion or more, to build the first prototype. New legislation requires the NRC to make changes in the way it reviews advanced nuclear reactor designs, but it will take some time, perhaps several years, for the agency to develop the technical and regulatory basis for implementing these changes. In 2017 TerraPower came to an agreement with CNNC was to form a joint venture company that would complete the design of the travelling wave reactor and commercialize the technology. The firm, Global Innovation Nuclear Energy Technology Company Ltd, was expected to not only build a first of a kind prototype (FOAK), but also to offer the full size design for export. Unlike traditional nuclear reactors, this technology will be capable of utilizing fuel made from depleted uranium, which is currently a waste byproduct of the uranium enrichment process. Its unique design gradually converts the fuel through a nuclear reaction without removing it from the reactor’s core, eliminating the need for reprocessing, generating heat and producing electricity over a much longer period of continuous operation. Additionally, eliminating reprocessing reduces proliferation concerns, lowers the overall cost of the nuclear energy process, and helps to protect the environment by making use of a waste byproduct and reducing the production of greenhouse gases. While Bill Gates as an investor has had to take a step back in terms of developing an advanced nuclear reactor design, he remains a strong advocate for nuclear energy. Gates said, “Next year I will speak out more about how the U.S. needs to regain its leading role in nuclear power research. He noted this work will be separate from his foundation activities. Gates wrote that nuclear power has to play a significant role in America’s energy use due to concerns about climate change. He pointed out that global emissions of greenhouse gases have resumed their upward trend. The clear message is that if the nation wants to decarbonize the electricity sector, it needs nuclear energy to keep the grid stable and the lights on. The MCFR project has the potential to be a relatively low-cost reactor that can operate safely in new temperature regimes. This means the technology can do more than generate electricity; it also offers potential in alternative markets, such as process heat and thermal storage. The MCFR design is a type of molten salt reactor (MSR). MSR experiments were conducted in the 1960s, and modern computing power, materials and engineering developments enable the revival of new research and development of MSR technology. TerraPower said in a statement on its website that integrating new reactor options into a diversified fleet can bring high-quality, carbon-free energy to heavy industry users, such as water treatment plants, refineries and chemical processors. TerraPower’s research and development of the MCFR project has already expanded into design and testing activities. In January 2016, the U.S. Department of Energy awarded a five-year, $40 million cost share award for continued research and development into TerraPower’s MCFR project. This award served as the impetus for a new public-private MCFR project development partnership that includes TerraPower, the Southern Company, Oak Ridge National Laboratory, the Electric Power Research Institute and Vanderbilt University. (NucNet): A government council has approved plans for Japan to continue with the development of fast reactors, although they are not likely to be fully commercialized and in use until the second half of the century, industry group the Japan Atomic Industrial Forum (Jaif) said. The plans were approved by the council on fast reactor development, part of the Ministry of Economy, Trade and Industry. The plans, initially drawn up by the council’s working group, say Japan could use the experimental fast reactor Joyo, and various facilities overseas, to acquire the technical knowledge that would have been obtained from the prototype Monju fast breeder reactor, which suffered a number of safety setbacks and has been designated for decommissioning. Joyo, a sodium-cooled fast reactor operated by the Japan Atomic Energy Agency (JAEA), is in Ibaraki Prefecture, eastern Japan. According to an outline schedule, starting in 2024, the national government, the JAEA and Japan’s power utilities, in cooperation with manufacturers, will narrow down the fast breeder technologies that can be used. The government will be responsible for ascertaining their political feasibility, JAEA will accumulate the necessary technical expertise, and utilities will determine the prospects for commercialization. Fast breeder reactors, which are being explored or constructed in Japan, France, India, Russia and China, allow a significant increase in the amount of energy obtained from natural, depleted and recycled uranium. The technology also enables plutonium to be used and recycled several times, and minor actinides to be recycled. Gates should invest one billion in NuScale to get these small reactors online a bit faster. Such an investment, of course, wouldn’t hurt his investment in TerraPower. I wish NuScale well, but I consider Molten Salt Reactors, and the breeding of new fissile fuel, far more valuable. Note, however, the appalling fact that the NRC permit applications cost NuScale a billion dollars. It is time to decommission that Commission. Another MSR company, Thorcon Power, asserts and has calculated that given “Efficient and Evidence Based regulation” they can build one-gigawatt reactors for less materials and labour costs, than is required for a one-gigawatt coal burner. They have a project going in Indonesia, having checked that, as a “group of retired guys” tey could not afford to wait twenty years for complete NRC approval. The DOE doesn’t have 1 billion to save the planet but the US has 25 B to build a wall? Is the travelling wave concept still viable? I thought it had been replaced in favor of the standing wave, and I never understood how heat would be transferred to a power plant. Aside to Rosa: Nuclear power and walls are both held in low esteem in some quarters. In the slighting language used by some folk, the Flying Scotsman locomotive was just a machine for boiling water. But Superman was lauded as being as powerful as such a locomotive. Seriously though, a steam turbine, or any _other_ kind of gas turbine, is just a “heat engine”, as is a reciprocating piston engine. 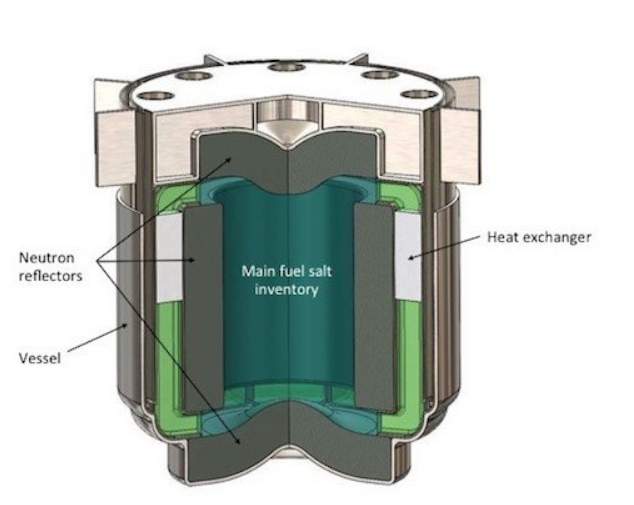 The huge advantages of a molten salt reactor, MSR, are that the working fluid does not have to be at a pressure of about 150 times atmospheric, and that the working fluid actually contains the fuel, so the energy from fission is immediately in that fluid. Solid uranium oxide fuel pellets transmit the heat much less efficiently. Once again, the working fluid in the reactor core transfers its energy to a similar fluid, the same molten salt but without the massive fissile fuel ions dissolved in it. Again, existing designs ultimately drive a closed cycle steam turbine, which drives an electric generator. Closed cycle turbines using gases other than H2O are contemplated, theoretically more efficient, but as yet unproven. It is high time for people interested in saving the entire biosphere from drastic thermal and chemical changes, to understand that just like warhorse power and the strong arms of yeoman bowmen, energy and power of any kind that can be used for war, can contribute just as much to peaceful ends. It grieves me that so many of my fellow-environmentalists Do Not GET It that wind turbines are not as clever as a full rigged ship, and yet coal and oil driven ships swept the beautiful tall ships clear off of major oceanic uses. There is NO WAY that wind and solar can replace fossil carbon burning. But nuclear did, in France, and the fossil carbon trade in Europe has kept up a propaganda onslaught to deceive and frighten the people.